« Will The Colts Have RB Richardson On A Short Leash? LAST GAME 10/20/13: Broncos 33 at Colts 39. Indianapolis QB Andrew Luck throws for 228 yards & 3 TDs. Colts defense forces 4 TOs (3 FF, 1 INT). DE Robert Mathis records safety. LAST GAME AT SITE 9/26/10: Colts 27, Broncos 13. Indianapolis QB Peyton Manning completes 27 of 43 passes for 325 yards & 3 TDs. Colts WR Austin Collie has 12 rec. for 171 yards & 2 TDs. BROADCAST NBC (6:30 PM MT): Al Michaels, Cris Collinsworth, Michele Tafoya (Field reporter). Westwood One: Kevin Kugler, James Lofton, Hub Arkush (Field reporter). SIRIUS: 84 (WW1), 92 (Ind. ), 93 (Den.). XM: 227 (WW1), 226 (Ind. ), 225 (Den.). COLTS: In 2013, QB ANDREW LUCK became 1st QB selected No. 1 overall to start playoff game in each of 1st 2 seasons. Passed for more yards (8,196) than any other QB in NFL history in 1st 2 seasons. In last meeting, passed for 228 yards & accounted for 4 TDs (3 rush, 1 pass)…Since 2012, RB TRENT RICHARDSON has 14 rush TDs, tied for 4th in AFC…WR REGGIE WAYNE (1,006) is 1 of 9 players in NFL history to reach 1,000 career catches. Colts are only team in NFL history with 2 1,000-catch players (MARVIN HARRISON, 1,102). Needs 19 rec. to surpass ISAAC BRUCE (1,024) for 7th all-time. Since 2001, has NFL-best 13,566 rec. yards. In 2013, WR T.Y. HILTON set club record for rec. yards in single playoffs (327). WR HAKEEM NICKS makes Colts debut. Averages 18.8 yards/catch in last 4 vs. AFC (16 rec., 300 yards)…DE FILI MOALA had sack in last meeting. LB ERIK WALDEN forced fumble in last meeting…BRONCOS: Set all-time single-season record for points in 2013 (606) & became 1st team in NFL history to have 5 players score 10+ TDs each in same season…QB PEYTON MANNING set single-season passing record for yards (5,477) & TDs (55) in 2013. Ranks 2nd all-time in career yards (64,964), comp. (5,532) & TDs (491). Selected No. 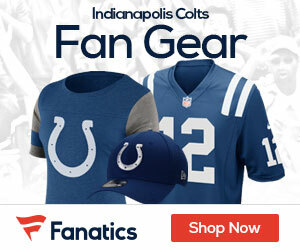 1 overall in 1998, Manning spent 14 seasons (1998-2011) with Colts. Won 4 AP NFL MVP awards with Ind. & ranks 1st in career pass yards (54,828) & TD passes (399) in club annals…Last Dec., RB MONTEE BALL totaled 382 scrimmage yards in 5 games (76.4 avg. )…WR DEMARYIUS THOMAS led all NFL WRs with 14 TD catches in 2013. Only player in club history with 2 1,400-yard receiving seasons. In past 3 vs. Colts, WR WES WELKER has 25 catches (8.3/game) for 286 yards. TE JULIUS THOMAS led AFC TEs with 12 TD catches in 2013, surpassing HOFer SHANNON SHARPE (10 in 1996 & 1998) for single-season record by Broncos TE…Since joining NFL in 2011, LB VON MILLER ranks 3rd in AFC in sacks (35).